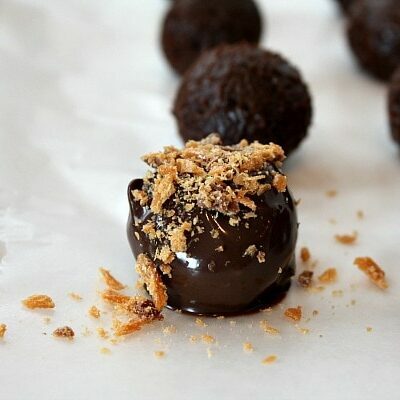 These Chocolate Chip Cookie Dough Truffles are little bites of egg free chocolate chip cookie dough covered in a chocolate coating. Watch the video showing you how to make these, then scroll to the bottom of this post and print out the recipe so you can make them at home! 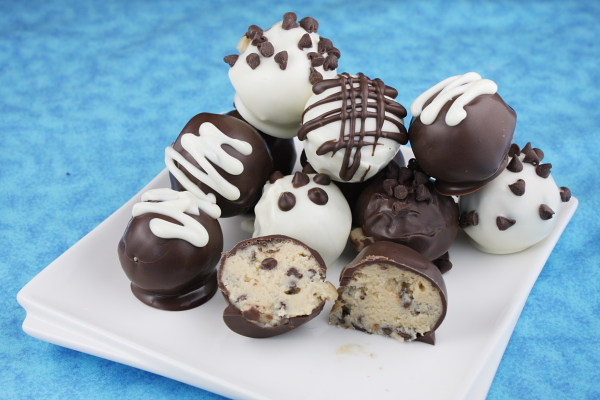 If you’re a lover of chocolate chip cookie dough, you’re going to love the creamy centers of these Chocolate Chip Cookie Dough Truffles. That’s chocolate chip cookie dough covered in chocolate. These are so delicious! I’ve never liked chocolate chip cookies. Go ahead and throw tomatoes at me if you’d like, but I just don’t really like them. They’re a plain old cookie, after all, with a few studs of chocolate chips in them. And they’re nothing special to me, unless I can get some cookie dough-action before they meet their fate in the oven. I’d much rather drown my sorrows in a bowl of cookie dough than nibble a dozen “cookies” dipped in milk. Yep, the cookie dough is definitely where it’s at. And these look so pretty displayed on a platter for sharing! I know there are plenty of cookie-dough-nay-sayers out there… you know, the salmonella scare and all . Well, I grew up licking cookie dough beaters and cake batter-covered rubber spatulas. I guess I’ve been lucky. 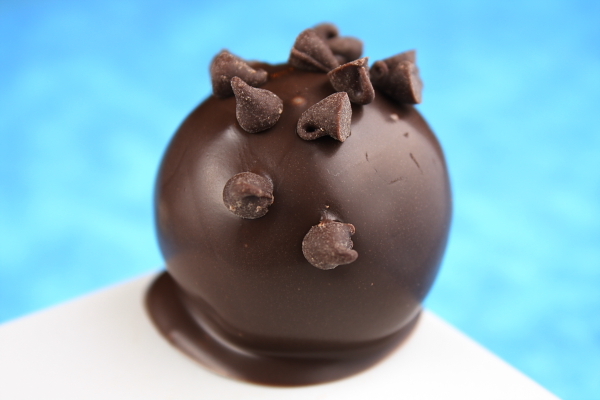 In any case, these Chocolate Chip Cookie Dough Truffles do not contain any egg, so no worries there. Some people worry about using flour too. So just in case flour is going to be a risk, I’m suggesting that you toast your flour in the oven before using in this recipe. You’ll just put the flour in pan and toast it at 350 degrees. F. Then you can feel safe to use it in an uncooked cookie dough recipe. First you’ll make the cookie dough. There are a couple of important things to note here. The cookie dough recipe calls for using butter and sweetened condensed milk. Don’t substitute anything else! Use butter, not margarine or soft tub butter or anything else but butter. And use sweetened condensed milk, not evaporated milk or regular milk or cream or anything but sweetened condensed milk. 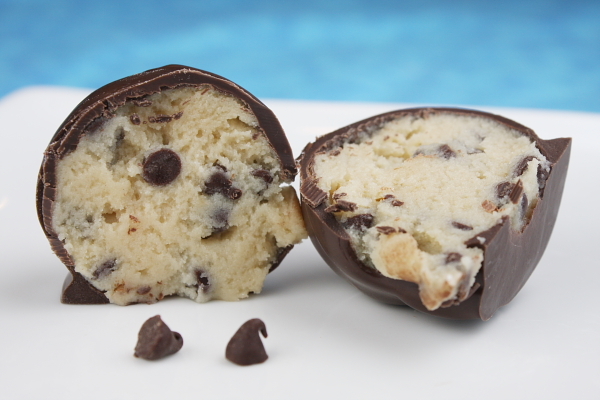 If you follow the directions, your Chocolate Chip Cookie Dough Truffles dough will turn out just fine! Be sure to chill the dough before trying to roll these into balls. 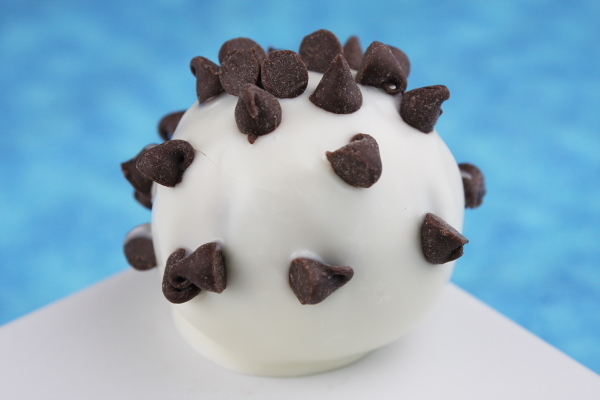 Chilled chocolate chip cookie dough is rolled into 1-inch balls. You’ll get 3 to 4 dozen of them out of this recipe. 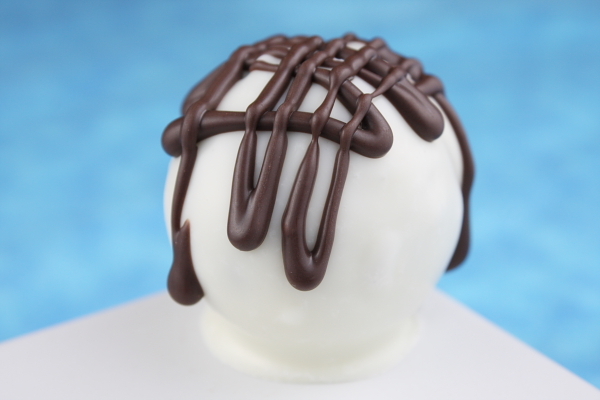 Those chilled dough balls are dipped in chocolate and then placed onto waxed paper to set. I like to use chocolate melting wafers (or Ghirardelli White or Dark Chocolate Bark). And it’s fun to use both regular chocolate and white chocolate. Add any special decor you’d like to the tops. Refrigerate them again if you’d like them to set quickly. 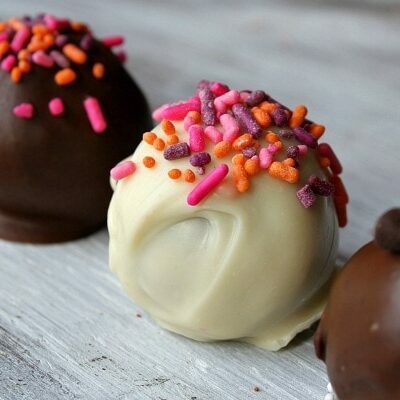 To fancy them up your Chocolate Chip Cookie Dough Truffles, drizzle alternate colors of chocolate on top. Sprinkle with additional chocolate chips, add sprinkles or other decorative goodies. You can have fun with these. Oh yeah! 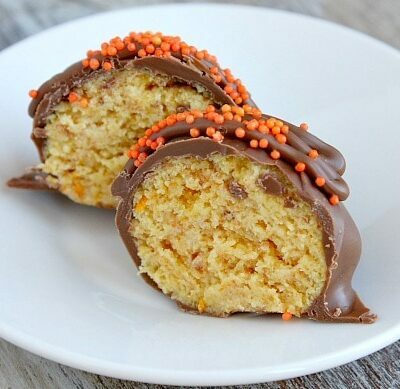 There’s that cookie dough inside. 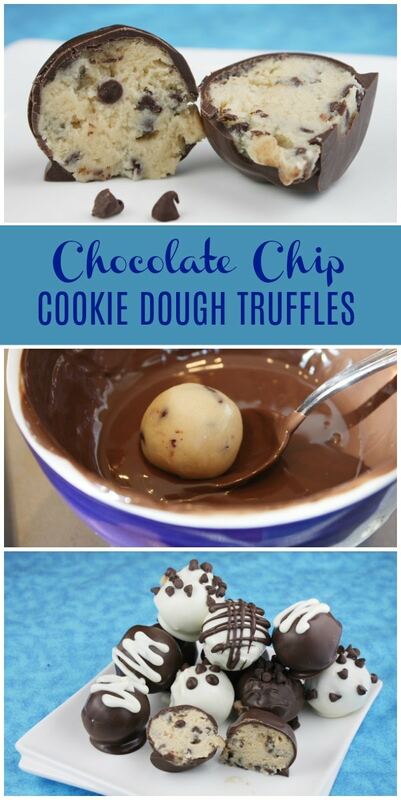 These are for cookie dough lovers. 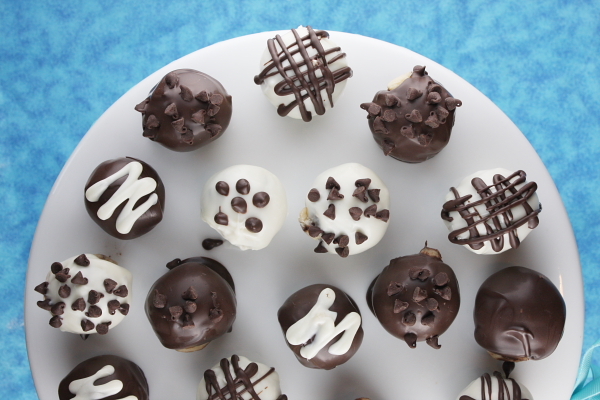 If you love cookie dough as much as I do… you’ll love these little treats. 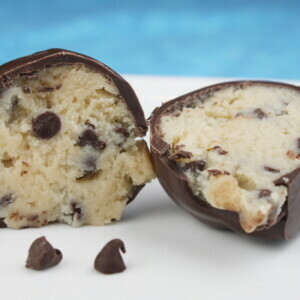 There is no egg in the dough… just a creamy dough center and chocolate chips as you bite into that chocolate exterior. 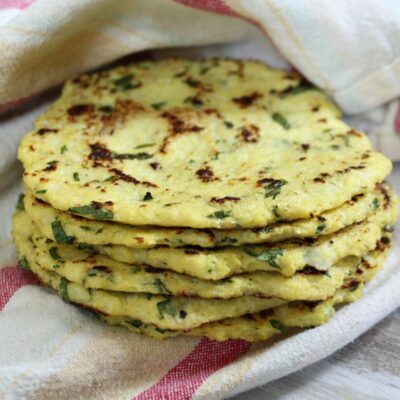 These are a big time favorite recipe! 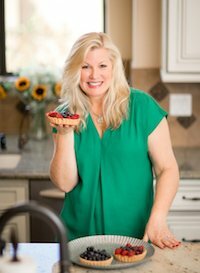 If you love all things cookie dough, you might also enjoy my Chocolate Chip Cookie Dough Brownies or my Chocolate Chocolate Chip Cookie Dough Truffles. Cookie Dough S’Mores are also a delicious idea. 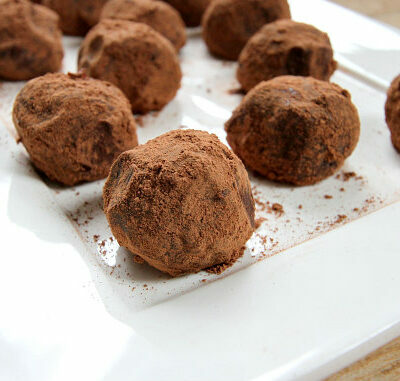 Egg free chocolate chip cookie dough chilled and dipped in chocolate to create truffles! 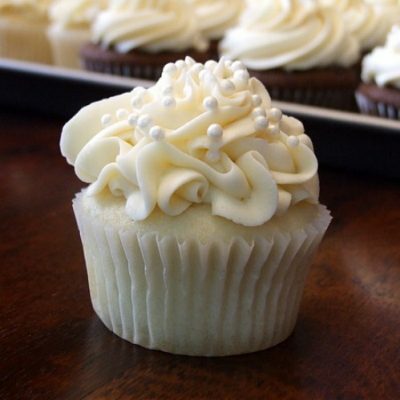 In a large bowl, use an electric mixer to cream together butter and brown sugar. Add the vanilla. Beat in the flour, 1 cup at a time, until it is incorporated and you no longer see chunks of brown sugar (if you spot any, just squish them). Beat in the sweetened condensed milk and mix until well-combined. Stir in 1 cup of chocolate chips. Cover the bowl of cookie dough and refrigerate until the dough is firm (at least 1 hour- maybe more... you want the dough to be quite firm). Use a small cookie scoop to scoop out heaping tablespoonfuls, roll into balls and place on a waxed paper-lined cookie sheet. 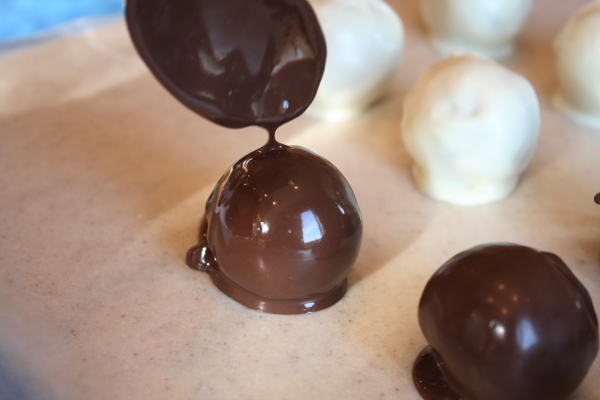 Place all of the rolled balls back into the refrigerator until you are ready to dip them in chocolate. Melt the chocolate bark in a glass bowl- easiest to do in the microwave in 30 second bursts, stirring after each heating time, until smooth. 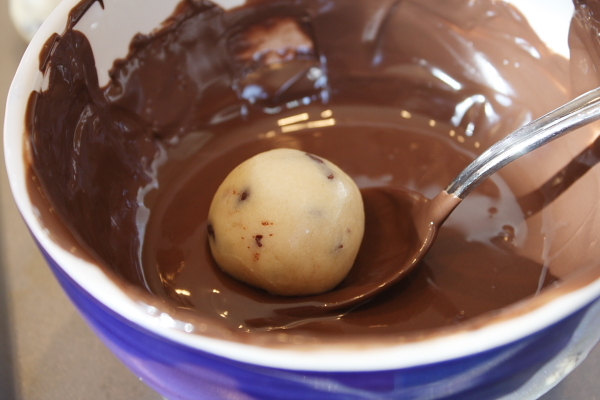 Use a spoon to help you dip the chilled dough ball into the chocolate and roll it around to cover all sides. Place it on a waxed paper-lined platter. Sprinkle with any desired toppings. Repeat with the rest of the dough balls. They'll begin to set pretty quickly. Keep them refrigerated until ready to serve. *To eliminate any dangers of using raw flour, toast your flour in the oven for 10 minutes at 350 degrees F. Then it will be safe to use in an uncooked cookie dough recipe like this one. 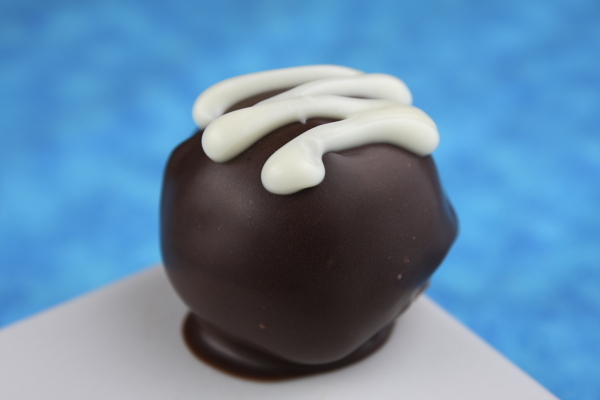 *I use the Ghirardelli Candy Making Dipping Bar- both Double Chocolate and White flavors. It's available at Sam's Club- they may have it at Costco too. *You may wish to speed up the chilling process and place the balls into the freezer, but it's not such a good idea. 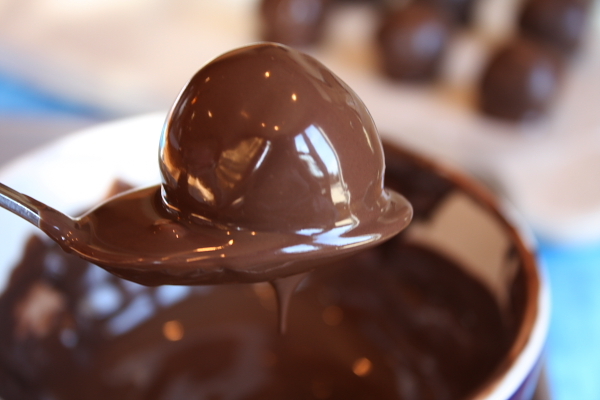 The dough freezes up and then when it begins to warm up again- it expands and may cause the chocolate coating to crack. 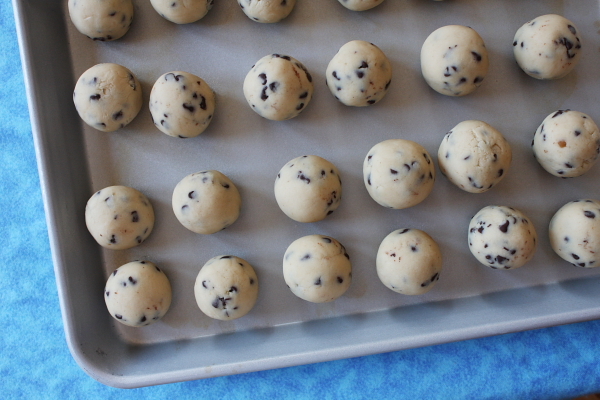 *Have your own favorite cookie dough recipe? Leave out the eggs, add a little milk to compensate for any dryness in the dough, and try making truffles with your own recipe! This recipe was originally published in 2010. It was edited and republished in 2018. I have made these the past two years for my preschool parents, as well as for my family, and they love them!!? Hi! I am wanting to try these they look amazing! I was wondering if you could tell me what size cookie scoop you use to get how many truffles? Thank you! I have a couple of cookie scoops, and I used my smaller one for these. Not sure of the size! I can eat about 10 of these in one sitting. SO GOOD! My family goes wild for these! Oh, yeah! 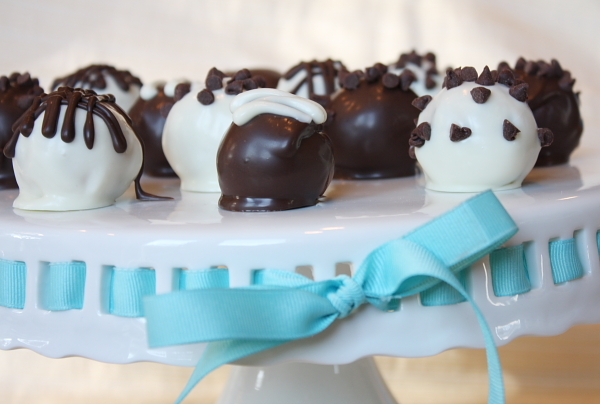 I’m all about the cookie dough, too, and these truffles are one of the best things I’ve ever eaten!!! 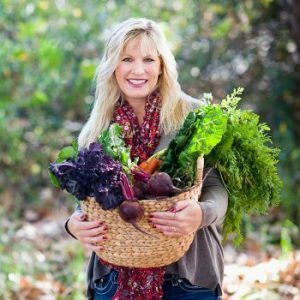 Fun and unique for edible gifts! These were great on our cookie exchange platters this year! These are absolutely a family favorite and we made them for holiday gifts this year too! I was hesitant to making this recipe after I seen the comments about the dough not hardening enough. However I tried it and was not disappointed. The dough came out perfect, I had no issues at all and only refrigerated the dough about 50 minutes. With baking you have to be very precise with the measurements of ingredients. I would def make these again. They are sweet but perfect at the same time. My family loved them! The only thing I changed was toasting the flour and allowing it to cook before I used it.